If you live in a place where there is a large population of June Bugs, moths, etc, they can be a real pain. Most outdoor lighting draws them in in noisy clouds. Motion lights are an improvement, but if the bugs are big enough, they can continuously trigger many of the less fancy models, but there are several things you can do to minimize this. 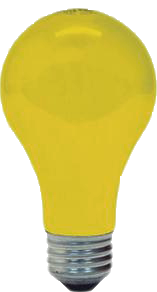 Personally, that yellow color would drive me nuts. A second option is to just kill them. I highly discourage the use of poisons. Most bug poisons are indiscriminate killers. When you look at our current honey bee die-offs, and the history of things like DDT, the poisons really don’t seem worth it. Increasingly, they are finding traces of them within us as well. 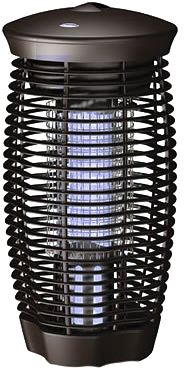 There are a huge number of bug zapper products out there (amazon alone sells around a hundred different models ) that are especially effective against this sort of insect. There are even solar bug zappers now, although they have a lousy track record on the mosquitoes they are advertised for. Bug zappers have their own set of issues: They use up electricity (except the solar ones) They are loud, and if you live in an area where the bugs are thick, you really aren’t likely to be able to keep up. If you are putting up a zapper, keep in mind that it doesn’t need to be right next to your favorite rocking chair; put it out back where it won’t be so noticeable. A third option is to change where you are lighting from. Switch to spotlights, and put them away from where the bugs are a nuisance, but where it can shine on the areas you frequent. My fourth and final suggestion is a bit more involved, but will solve the problem nicely. The key is to put up outdoor motion lighting, but to keep the sensor away from the lights themselves. 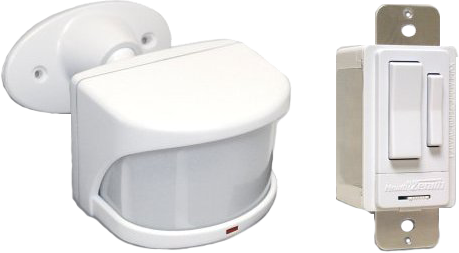 There is a very nice motion sensor kit designed for doing just that. It allows you to put up the kind of lighting you like, and then just switch out the light switch for one that communicates wirelessly with a battery powered motion sensor. Put the sensor where it can cover the area you want covered, and now if the bugs are flying around the light, they won’t trigger it to stay on. Remember, you don’t have to make the system perfect, you just have to have a better setup than the neighbors. The bugs will congregate there.